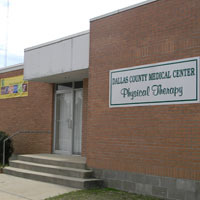 Dallas County Medical Center: Physical Therapy. At the DCMC Physical Therapy Department, our mission is to provide quality outpatient therapy to the residents who live in our area. In cooperation with your physician, our professional staff works to return you to your highest functional ability possible. This is accomplished with the experience of caring professionals using current techniques and equipment. This well equipped and utilized physical therapy department features one fulltime Physical Therapist, one fulltime Physical Therapist Assistant, one full time Physical Therapy Aide, one Occupational Therapist and one part-time Physical Therapy Aide. The Physical Therapy Department, in conjunction with the Dallas County Medical Center Gift Shop sells BIOFREEZE. This pain-relieving product is available in several forms: roll-on, gel, spray and the newly-arrived wipes.